Detailed below are the instructions on how to use the ATLAS TimeCard app as an employee. If it seems like options are missing or that the app isn’t working, it may be a technical issue. Email ATLAS at atlas-apps@illinois.edu for additional support if the guidelines below don’t answer your question(s). Log their work hours with the clock in / clock out button. View previous TimeCard entries by selecting different pay periods. Employees cannot alter their TimeCard information; this ability is left up to the system administrators and their group managers. Click Clock In to begin logging work hours for the day. Click Clock Out to stop logging hours for the day. 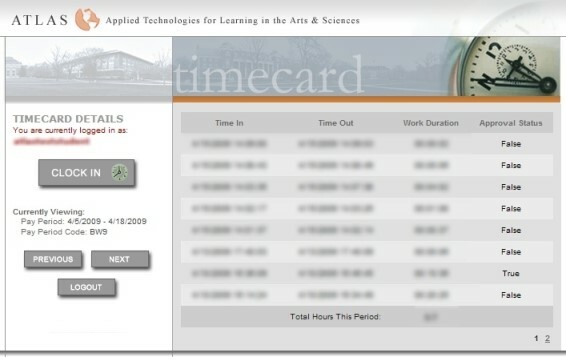 *Important* Reopen the TimeCard application before clicking Clock Out. Otherwise the action will not go through and the application will continue to log hours.